My favourite dog articles, thoughts and opinions. Ever Wonder Where Your Dog’s Courage Comes From? We’ve all seen it happen. The small dog give chase to a much bigger, supposedly ‘tougher’ beast, sending it packing with tail tucked firmly between its legs. 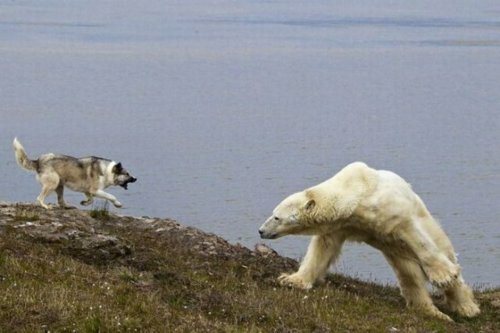 The animal equivalent of Dudley Moore putting the fear of God in to Mike Tyson. The saying goes, it’s not the size of the dog in the fight, it’s the size of the fight in the dog. Maybe this (incredible) picture gives us an insight in to where this inner self-belief comes from…. Your dog is not a wolf. But he once was. Posted on October 8, 2012 January 31, 2013 Author RyanCategories DogsTags canine courage, dog braveryLeave a comment on Ever Wonder Where Your Dog’s Courage Comes From? A new book claims man can take on some spectacularly successful life lessons from man's best friend. 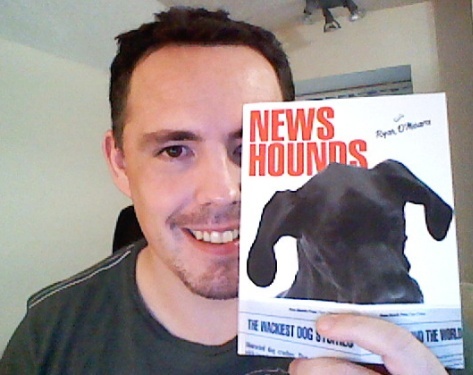 Ryan O'Meara, dog trainer and publisher of K9 Magazine claims in his new book 'Clever Dog: Life Lessons From Man's Best Friend' that thinking like a dog can improve our happiness, prosperity, friendships and decision making abilities. In arguably the greatest self-help book of all time written by the man who literally wrote the book on how to get more from life, relationships and careers, Dale Carnegie's 'How to Win Friends and Influence People' tantalisingly revealed a life lesson that deserves the attention of a more comprehensive study. Carnegie's seminal work named the dog as "the greatest winner of friends the world has ever known". I wanted to 'test' out how well my dogs would take to being looked after by my parents. They being very spoiled dogs, whenever I've gone away in the past I've always had someone they know come and live in my (their) house so they have very little disruption. Asking my parents to actually move home for a while to look after my dogs when I'm away seemed a bit much so I thought, in order to satisfy my own mind, I'd let Mia and Chloe go and stay at my Mum and Dad's house for a 'test' run. Dogs in Vogue: Are Dogs Treated as Fashion Accessories? Today I made my second appearance on BBC Radio 4’s ‘Woman’s Hour’ radio show. 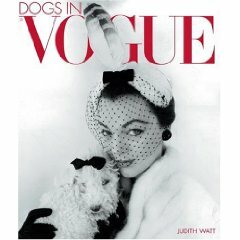 The topic was related to the recent book ‘Dogs in Vogue’ which is, as it happens, a very nice book – amazing shots (as you’d expect) and in my opinion didn’t portray dogs as fashion accessories at all. Continue reading Dogs in Vogue: Are Dogs Treated as Fashion Accessories? Posted on November 12, 2009 January 31, 2013 Author RyanCategories DogsLeave a comment on Dogs in Vogue: Are Dogs Treated as Fashion Accessories? The link below is to an interview I did last week regarding death row dog, Bruce. A pet who was taken from his owner in Northern Ireland having never done a single thing wrong and who is openly described by those who seized him as perfectly friendly. It is the scourge of communities across Scotland and beyond, and no council has escaped censure for failing to clean up its act. Now one local authority has unveiled a novel solution to the problem of dog dirt – spraying it bright pink in a bid to shame guilty owners. “While it is well-intentioned, this type of scheme will not deter the sort of irresponsible people who allow their dogs to foul this way. Well, alls I know is – Ryan O’Meara is the editor-in-chief of K9 Magazine (not ‘K9’), he is the chief exec of the Coalition for Improved Dog Ownership Standards (not the chair) – but he DOES think that spraying poo pink is not really the answer to addressing the problem of irresponsible dog owners who allow their pets to foul the streets although he’s not entirely confident enough to place such a precise figure on the fine that will make dog owners think twice about clearing up after their animals. Today I received a box from the USA. My first ever forray in to the world of writing for a publisher who wasn’t, well, me! It’s been probably about a year since the book was completed, so unlike when the magazine comes back from the printer and the fatigue of working on the thing makes you virtually sick of the sight of it by the time you get it back in its hard copy form, I wasn’t totally against the idea of actually sitting and reading through the book! It made me laugh. I think it’s a really, genuinely fun book for anyone who ‘gets’ dogs and ‘gets’ what dogs are really all about. They make us laugh. They cheer us up. That’s why I agreed to do the book. It celebrates the dog and his ability to lift our mood. If you’d like to buy the book, I do hope you enjoy it!